These extra large, 40mm, light green glass eyes glass eyes give a bright glow when you turn out the lights. These originally-designed and crafted glass cabochons are perfect for jewelry making, bottle cap pendants, scrap booking, paper mâché sculptures, or other crafting projects. These glow-in-the-dark glass eyes are made with adhesive backing. You can peal the backsides off and stick these eyes where you want to add a touch of glowing life! Reflections on the cabochons are from the lighting, there are none in the actual eye design. Designed and created by Megan's Beaded Designs. 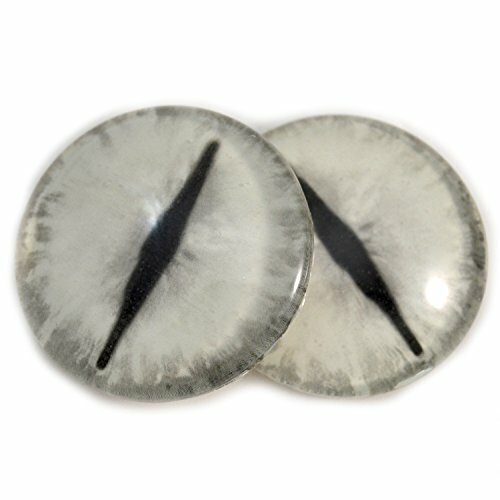 A pair of 40mm glass eye cabochons for jewelry making, doll sculptures, taxidermy, scrap booking, and more. These glow in the dark dragon eyes are sure to make your art project a hit! Original, handmade glow inthe dark glass eyes. Flatback glass eyes arrive on peel and stick adhesive backing. Simply peel the backsides off, and stick these eyes wherever you want to add soem glowing life!